Art education careers offer uniquely fulfilling opportunities to share the power of creative expression with others and help them discover inspiration. And, as an art teacher, you are uniquely positioned to make a difference in students’ lives. For example, a report from the National Endowment for the Arts suggested that opportunities to explore creativity may have positive outcomes for at-risk young people. Drawing on data from the U.S. Department of Education and Department of Labor, the study linked participation in the arts with higher overall academic performance and lower dropout rates for children and young adults of low socioeconomic status. If you’re considering a graduate degree before embarking on a career in teaching art, you probably have some questions like, “What can I do with a master’s in art education?” It’s important to consider not only the roles available to art educators, but the skills and qualifications you’ll need to excel. 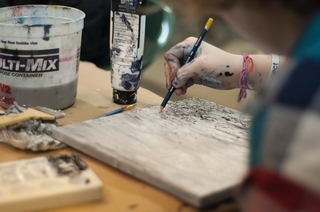 What Can You Do with an Art Education Degree? Many art education graduates go on to work in public, private or charter schools. Classes may take place during the regular school day or as part of an after-school program. In some cases, teachers travel between multiple schools in a district, especially at the elementary level. High school art courses focus on specialized areas such as painting, photography, ceramics, or video production. The curriculum may examine theoretical concepts and allow students more time to work on their projects independently. Pre-K-12 art teacher requirements differ by state. To work at most schools, instructors must complete a degree in art education from an accredited university, pass state exams that test their knowledge of art and teaching principles and receive a state certificate or license. Postsecondary teachers work with students in specialized areas like painting, drawing, graphic design, photography sculpture, animation, media arts or art history. Instructors at this level are often professional artists themselves, and you may find that teaching at a college or university brings you the flexibility to spend more time on your own practice. Many instructors in community and junior colleges are adjunct faculty–non-tenure-track professors who work on limited contracts–and they often have opportunities to teach courses online. Art museums offer educational programs geared for a variety of audiences. Educators lead groups of children, college students or adults in learning about pieces featured in the collections and completing their own projects. Museum staff may also host workshops for K-12 educators and collaborate closely with classroom teachers in developing engaging programs for their students. Community-based programs can be a powerful way of encouraging people of all ages and from a variety of backgrounds to connect with creative expression. An arts center can be a vibrant place that exhibits the work of local makers and hosts events like lectures and musical performances. In this setting, educators may guide participants through the steps of creating their own pieces, provide lessons in art history or interpretation and manage programming. Why Get a Master’s in Art Education? A graduate degree can mean more possibilities to start and advance in art education jobs, especially at the college level. According to the U.S. Department of Labor, a master’s is necessary for 55 percent of postsecondary art, music and drama teaching positions. An advanced degree may also help educators take on leadership roles, such as chair of an academic department, director of a community arts center or manager of a museum education program. Adelphi University’s online Master of Arts in Art Education (M.A. in Art Ed) program is suitable for recent college graduates, current teachers or career changers. By the time you graduate this two-year program, you’ll be ready to complete the requirements of New York State Visual Arts Pre-K–12 teaching certification. Along the way you’ll learn methods for nurturing creativity through flexible online courses taught by experienced faculty, customizing your curriculum with a wide range of electives. By completing hands-on fieldwork anywhere in the State of New York, you’ll put the concepts you’ve learned to work in the classroom. If you went back in time to the release of the Atari and told people that video games would become powerful teaching tools, they would probably have some serious doubts. Yet we’ve now seen that games like Minecraft can be used to engage students in the classroom, as well as employees in corporate training programs. We now understand that technology can transform the way we think of the classroom, and even transform learning itself. In fact, some people would say that video games will be important to the future of all education. What specific technologies could have educational value? How can certain technologies and tools be used to reach a desired learning outcome? What can instructors do to keep students engaged instead of distracted? There are also multiple ways to tackle problems like these. 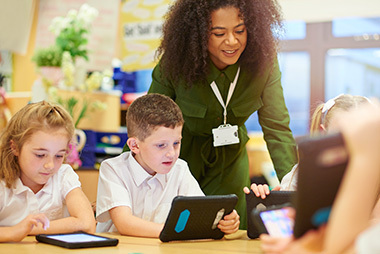 Technology can be integrated into a broader curriculum, but it can also be part of designing lesson plans for the classroom. Schools also hire educational technology professionals as consultants who help advise teachers and aid in designing lessons with an eye toward using technology effectively. When it comes to edech in business settings, software and other technology tools can be utilized to deliver virtual lessons, or to design multimedia training programs. However, some of the same challenges apply in these environments as in the classroom. For example, how do you encourage employees to be engaged in digital learning tools, and how can these tools be used to improve how well they understand the material? We know that, with so many career options and challenging issues out there, it can be difficult to decide which path is right for you. So, we wanted to highlight some of the careers with a master’s in educational technology that offer potential for personal growth as well as the chance to make a real difference in the field. If you pursue a master’s in educational technology, you have numerous career paths to consider. Although a lot of the opportunities in the field are in education, business training courses have also begun leveraging technology in new ways. For example, gamification is becoming a popular way to build softer skills such as communication, as well as teach topics that are not as interesting to most learners, such as a company’s compliance requirements. In both business and school settings, educational technology professionals with many different perspectives are needed. For example, if your background were in IT, your role may be to manage the implementation of technology like gamification software, or ensure that your organization has the supportive technology to make eLearning technology run optimally. If your background were in teaching, you’d be able to use the knowledge gained in an MA in Educational Technology program to integrate learning technology within your lessons. Regardless of your professional experience, the educational technology field is dynamic and growing, which means that you’ll find the most success if you’re the type of person who is inquisitive, creative and entrepreneurial. You may end up carving your own path as an edtech consultant, or be the one who pushes for technology-focused change within your organization. What is the future of Educational Technology? The future is bright for educational technology, with Frost & Sullivan predicting that global investments in the field will increase at a compound annual growth rate of 18.3% through 2022. However, professionals in the field will also face highly dynamic and ever-evolving challenges due to how quickly technology can change. For example, the ability to use artificial intelligence has historically been limited to companies with large technology budgets and that could invest in huge amounts of computer processing power. As AI has become more accessible, and available through cloud services like IBM’s Watson platform, however, education is now a key area for AI because it is highly accessible and easy for non-technical professionals to use. As a result, educational technology professionals will have to consider how to best use technologies like AI, which technologies are worth the hype and which aren’t, and how to best bring them into a learning environment. If you’re excited by complex challenges like these, an educational technology career is a great way to leverage your passion. We can’t predict everything that will happen in the future of edtech, but it’s safe to say that the field will bring exciting challenges, require tough decisions and present opportunities to shape the future of learning. Our online M.A. in Educational Technology program offers a blend of technical skills and problem-solving capabilities alongside theoretical and practical knowledge about teaching and learning. With this philosophy at its core, the program offers courses that teach practical skills, like Python and HTML5 programming, as well as a comprehensive exploration of theories of knowledge. The program also offers opportunities for you to gain exposure to innovations in the areas of edtech that interest you most. The large selection of electives gives you additional options to personalize your study, with topics including video games and learning, educational video production, mobile technology and learning, and social media.